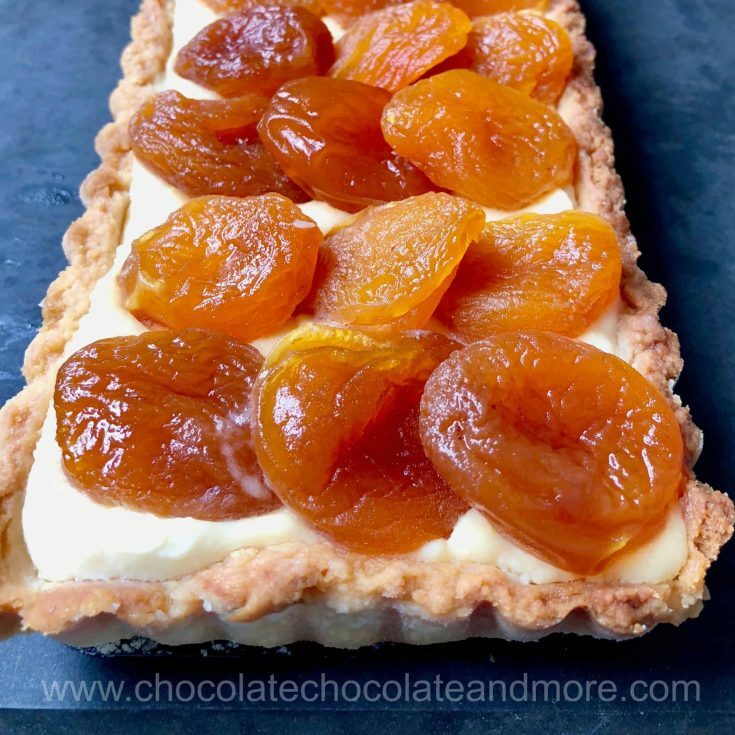 Apricot Mascarpone Tart - Chocolate Chocolate and More! 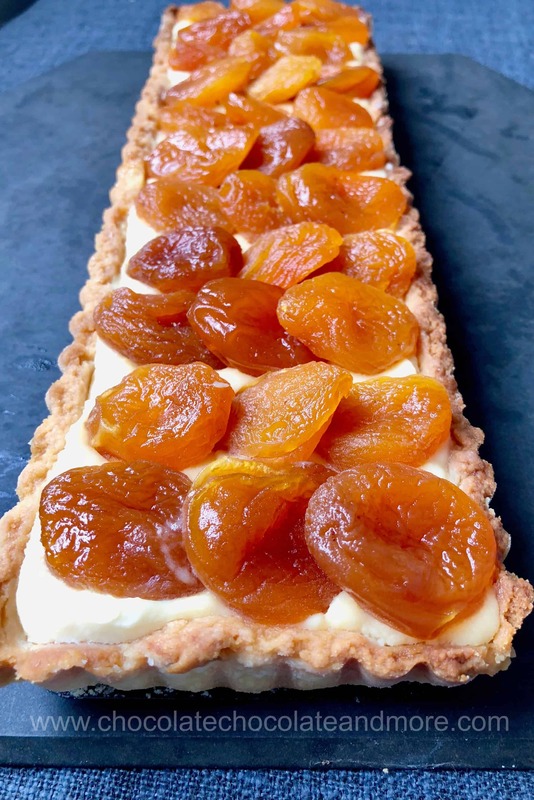 Lemon crust, creamy apricot flavored mascarpone cheese, and mulled apricots make this Apricot Mascarpone Tart a knock out dessert. Don’t have a tart pan? No worries. Make it in a 9″ x 13″ baking dish and cut into bars. I got a phone call this weekend asking me to make a special dessert for the 50th anniversary of a priest’s ordination. Anyone who’s worked at the same job for 50 years deserves the dessert of his choice. This priest wanted something apricot. I love the flavor of apricots. They’re great in pie, jam, dipped in chocolate… the list goes on. The problem is that apricots aren’t in season. While I love dried apricots, they’re just not as flavorful or tender as fresh ones. I learned a long time ago that you can rehydrate dried fruits by soaking them in boiling water. If you haven’t tried this, you’re missing out. Raisins soaked in boiling water for 10 – 15 minutes (and drained) stay plump in baked goods. I adapted Kitchy Kitchen’s recipe for this tart. I made a batch of mulled apricots and used nearly all of the syrup to flavor the mascarpone cheese. I only needed about half of the apricots for the tart so you’ll have left over mulled apricots for ice-cream topping or another tart. The result is truly amazing. The lemony pastry, tart tender apricots and creamy mascarpone are a fabulous combination. Everyone at the party said the only thing wrong with the apricot mascarpone tart was that it was too small. They all wanted seconds. Make this for Mother’s Day or on a cold day when you need a little sunshine. You’ll be glad you did. Combine flour and powdered sugar in a bowl. Use a pastry cutter or two knives to cut the butter into the flour mixture. Mix in the egg yolk and lemon juice to make a soft dough. Wrap in plastic and refrigerate for 30 minutes. Combine ingredients for the mulled apricots in a medium saucepan. Bring to a boil and then reduce the heat. Simmer for 50 minutes or until the apricots are soft. Let cool completely. For a tart, roll out the pastry dough into the shape of the pan and line tart pan with the dough. Cover with parchment paper and fill with beans or pie weights. Bake at 350°F for 20 minutes. Remove the parchment paper and beans (or weights). Bake another 5 minutes until golden. Let cool. Mix the syrup into the mascarpone cheese. I used a mixer on medium speed. Assemble the tart. Spread the mascarpone cheese in the tart. Top with mulled apricots. I already had time to prepare the tart according to your recipe. It was very tasty! Only I used dried apricots, raisins and prunes. The result was an excellent fruit mix. That sounds wonderful. I will have to try mixing it up next time!